You are here: Home / The National Action Plan for sustainable management of resources in Lake Tanganyika basin in Burundi was validated. The National Action Plan for sustainable management of resources in Lake Tanganyika basin in Burundi was validated. Representatives of the Ministry of Water, Environment, Land and Urban Planning, the Ministry of Home Affairs, Ministry of Mines and Energy, Lake Tanganyika Authority, local environmental NGOs and some environmental development partners (UNDP, Global Environment Facility – GEF and UNOPS) validated, after some amendments, the document of National Action Plan (NAP) for Lake Tanganyika natural resources management. Representatives of the Ministry of Water, Environment, Land and Urban Planning, the Ministry of Home Affairs, Ministry of Mines and Energy, Lake Tanganyika Authority, local environmental NGOs and some environmental development partners (UNDP, Global Environment Facility –GEF and UNOPS) validated, after some amendments, the document of National Action Plan (NAP) for Lake Tanganyika natural resources management. 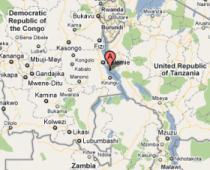 That document was commissioned by the Lake Tanganyika Authority and the UNDP/GEF Project. According to the Permanent Secretary to the Ministry in charge of Environment, M. Epimaque Murengerantwari, Lake Tanganyika is a famous environment hotspot in the world, notably for the numerous characteristic habitats all along the coastal area and the varied fauna most of which comprises endemic species. It is estimated that the lake occupies 2.300 km2 in Burundi and 159 Km coast line, hosts at least 1,500 animal species among which about 600 are endemic to the lake. There are 254 fish species among which more than 200 are endemic, as he mentioned. However, he noted, the trans-boundary challenges for this lake sustainable management are such as the climate changes, unsustainable fisheries, unsustainable land management, the destruction of critical habitat, biological invasions and the increasing pollution. 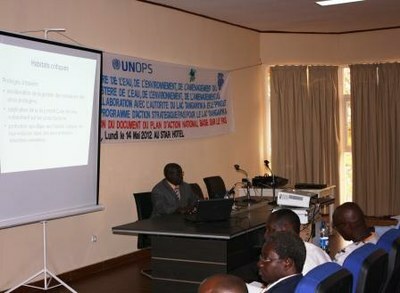 According to Gaspard Ntakimazi, Consultant and University Professor, the document is about a National Action Plan for implementing the Strategic Action Programme (SAP) for protecting the Lake Tanganyika biodiversity that was adopted in Kigoma (Tanzania) last February by the 5th Lake Tanganyika Authority Conference of Ministers, (Burundi, DRC, Tanzania and Zambia). He sparked off discussions about challenges when he mentioned that surveys conducted under the LTBP project in 1997-1998 highlighted that more than 50 different fishing gears were used in Lake Tanganyika, and 12 of which are more frequently used. To him, the fishing pressure and all the fishing gears in coastal and pelagic areas are an increasing threat to the sustainability of the lake fishery resources. According to the results from the PRODAP 2011 frame survey, the fishing pressure has practically doubled from 1995 (44957 fishermen, 13192 canoes 1264 of which are motorized) to 2011 (94886 fishermen, 28212 canoes among which 3336 are motorized). Fisheries on Lake Tanganyika are characterized by a free access. Management of coastal and pelagic fisheries, as well as the management of activities affecting the lake basin, should be done under the regional planning frame including activities on the basin and the lake resources. He also indicated that the numerous natural resources in the lake and its basin are important resources, generating incomes and livelihoods for 12.5 to 13 million inhabitants. For Burundi case, he added, the direct riparian population was 2.04 million in 2008 and should be about 2.24 million in 2012.